Kate Reilly can't remember a worse time in her life, on-track or off. She wrecks her racecar at Road America in Wisconsin, sending a visiting NASCAR star to the hospital, and loses her cool on-camera, only to end the day by discovering her boyfriend with a friend of hers. A dead friend. With little time to grieve, Kate finds herself the pariah of the racing world, the target of vicious e-mail messages, death threats, and a frenzy of blame on racing sites and blogs, including an influential, anonymous blogger who's trying to get her fired. But nothing is as bad as knowing her friend's killer is still out there—and aiming at Kate. She's riding a roller coaster of emotion, juggling an exciting new sponsor, a boyfriend she's not sure she can trust, and new-found family she doesn't want to claim. Dodging unfavorable media attention and a pit reporter with a bias against women in racing, Kate redeems herself behind the wheel at Petit Le Mans, the season's final, ten-hour, endurance race. The championship race weekend and an undercurrent of threats on all sides rev Kate's nerves to their limits. From on-track action, to sponsor parties, to the Series awards banquet, she's part of the action, uncovering motives, secrets, and powerful ambitions. Ultimately she learns no one can escape the past—but only a murderer is driven by it. "Kate's second outing is just as fast-paced as her first, balancing mystery and racing adventure all the way to the checkered flag." "Kaehler's second Kate Reilly mystery (after 2011's Dead Man's Switch) races through a packed plot and skillful dialogue nearly as expertly as driver Kate threads her way through a racecourse." "Action from page one ensures an engrossing read with abundant twists in the plot." 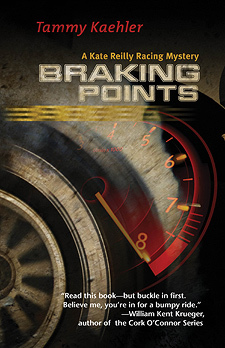 "With Braking Points, Tammy Kaehler once again delivers a breathless joyride. Kaehler conjures enough unexpected twists and blind turns in this dynamite series entry to satisfy even the most demanding reader—or race car driver. And could there be a more engaging protagonist than Kate Reilly? Smart, funny, flawed, she'd won me over long before the first checkered flag came down. Read this book—but buckle in first. Believe me, you're in for a bumpy ride." "Break-neck pacing, non-stop action and authentic at every turn. A high-octane mystery that'll keep you turning pages at top speed—the talented Tammy Kaehler knows her stuff!"